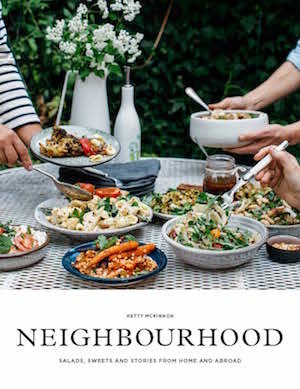 Neighbourhood, by Hetty McKinnon. is a cookbook full of hearty salads, delicious sweet treats and charming stories about food, family and friendships. Hetty MckInnon who wrote it used to run a very popular community kitchen called Arthur St in Surry, a Sydney suburb, where she delivered her salads to the locals on her bicycle. She recently relocated to New York with her family and, inspired by her travels, is now creating salads with more international flavours. She sees food as the best way to bring neighbours together and build healthy communities. Her salads are inventive, generous and made to share. The desserts and sweet treats such as the olive oil and sea salt molten brownies, the lemon curd and coconut slice and the almost instant raspberry mousse are irresistible. Or cook up a batch of this delicious eggplant and tomato relish .A jar of this, tied with a red ribbon and with a pretty handmade label, would be the nicest way to thank them for always being there to collect your mail and feed your cat when you go on holiday. This spiced eggplant and tomato relish is my Christmas gifting staple. Packed into pretty jars, this is the most delicious edible gift, to be enjoyed over the holidays with cheese and crackers. When not gifting, pair this relish with sweet roasted butternut pumpkin and chickpeas for a hearty, vegetable-packed salad. This dish deﬁnitely exudes a fancy festive attitude. It is VG and GF and serves 4-6. 1 butternut pumpkin (about 1.4 kg), peeled and cut into 2 cm cubes. Preheat the oven to 200˚C. Place the butternut pumpkin on a large baking tray, drizzle with the olive oil and season with salt and pepper. Roast for 20–25 minutes until golden. Combine the pumpkin, chickpeas and baby spinach and spoon over the relish. Mix everything together well, then scatter over herbs and slivered almonds to serve. This review first appeared on the GrownUps website https://www.grownups.co.nz/life/our-people/lyn-potter/.